When you want to invite an acquaintance of yours to a wedding, a baptism and so on, you send them an invitation. The invitation is a way of showing that you want this particular person to be present. Invitations are also sent to the devil. There are “specialists” who make good luck charms with invocations to the devil. Unsuspecting people then wear these and, in ignorance, invite the devil into their souls. To the same category belong bats’ bones, horseshoes, the pentagram and so on. There are games, such as the ouija board, which are exceptionally dangerous for children. Some years ago, an Athenian visited India. On his return, he brought a native game back as a souvenir for a friend of his. One day, as his friend was gazing at it curiously, it gave out a strange noise and all of a sudden, Satan himself appeared before the man! What is the Cross? It is simply inanimate material (wood, metal, etc.) in a particular shape. But it’s this shape that repels the devil. An idol is similarly an inanimate object in a particular shape. And just as the shape of the Cross repels the devil, the shape of the idol attracts him. So jewellery in the form of pagan idols attracts the devil. There are some vain women who, to create an “effect”, decorate their homes with all sorts of objects of unknown provenance. How can they be sure, poor things, that by doing this they aren’t inviting the devil into their homes? She had been led astray by a group of young people who followed a guru. While they were all sitting cross-legged, holding hands and meditating, she did a test. She had a New Testament with her and said the Lord’s Prayer, silently and in repentance and contrition. The result was that no one in the group could concentrate or meditate! The leader of the group “smelled a rat,” became thoroughly unpleasant, and got rid of her. The New Testament, the word of God, along with the Lord’s Prayer, tore up the invitation they were sending to the devil through their meditation. St. John Chrysostom also teaches that foul language is another form of invitation to the devil: “Foul language also besmirches and invites demons.” Songs with dubious lyrics and certain kinds of music are also invitations to the devil. If you tell somebody to go to hell, that’s an invitation to the devil. An inhabitant of a village in Achaia, Greece, related the following to me. His married daughter, who lived in the nearby town of Patras, lost her temper and told her son to go to the devil. Satan promptly appeared in her house. From the waist down, he had the body of a man, but from the waist up that of a jet black goat, with horns! And he had his mouth open. Another eye-witness told me that, in his village, a father became very angry and said to his child: “May the devil enter you.” And suddenly there was the devil before them. “You called me and I’ve come”, he said to the father. At the time of St. Dionysios of Olympus, there lived in Beria a learned Christian. One day, a book of magic came into his possession. Out of curiosity, he began to read invocations to the devil. The result was that night, he saw, as in a dream, a gigantic demon. “I came because you called me,” said the demon. “I bow only to my Lord, and He alone do I worship,” replied the terrified Christian. “Since you won’t bow to me, why did you call me?” answered the enraged demon, who began to beat his victim relentlessly. The Christian awoke in a cold sweat. He felt unbearable pain about the face. He started shouting and crying. His condition worsened. His face was so bruised and swollen that his eyes were closed. In the end, he was healed by the prayers of St. Dionysios of Olympus. A high school student heard that she could invite the devil into her home if she lit a candle, bound the Holy Scriptures with a rope, held them upside down and muttered some “prayers.” If the Scriptures began to swing backwards and forwards, that would be a sign that Satan was on his way. The young 16-year-old followed the prescribed “ritual.” The hanging Scriptures did, indeed, begin to swing, the table oozed blood and there, suddenly, was the devil himself. Any kind of magic, however “innocent” and “harmless” it may appear to be (spells and so on), is an invitation to Satan. In the book “Miracles of our Lady the Eikosifinissa,” we learn that an Athenian woman, a Mrs Xanthaki, was having trouble with her husband. He was deceiving her. In order to find a solution to her problem, she visited a “good woman” who was a medium. The latter read some magic for her and gave her nine chickpeas to put in her house, so that her husband would come to his senses. (What childishness!) The woman did as she was told. But from then on, every night, she had nightmares. She dreamt of a savage man with hideous features (the devil), who kept telling her, “I’m going to kill you.” In the end she was cured by the intervention of the Mother of God. The Lord said: “This kind will not depart except by prayer and fasting.” Fasting concerns the body, prayer the soul. So we have body and soul, the whole person, against the devil. The power of the devil lies in the belly. In other words, when people eat and drink without restraint, this becomes a weapon in the hands of the devil, which is turned against them. So, fasting disarms the devil. 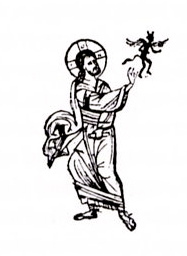 This is borne out by the experience of the hymnographer who wrote, “For not even the wanton insults of the demons dare to be brought against those who fast” (Triodion, Vespers on Monday of Cheese-fare Week). We have many instances in the lives of the saints in which the devil is put to flight by the weapon of fasting. Let’s recall how the evil spirit was thrown into a panic at the name of Jesus. The medium, despite being in a “trance,” leapt up from his chair and then collapsed in a dead faint. Tell a possessed person to say the word “Christ” and they'll certainly refuse. Thus, the prayer “Lord Jesus Christ, have mercy on me” brings fear and trembling to the demons. Water that has been blessed by a priest through special prayers is a receptacle of Divine Grace and, as such, is fire that burns the devil. In 1925, a possessed person visited the Holy Monastery of Dionysiou on the Holy Mountain. Fr Vessarion, a monk of the monastery, gave him a glass of water, into which he had secretly poured some holy water. “Have a little drink to quench your thirst,” he told him. “You’ve burned me, monk!” And he spat out the water that was in his mouth.